This is the second eclipse within the the last few months and I almost missed it. Luckily we were alerted and ran outside to find it about one third over. It appeared to ultimately have a 65-70% coverage, here in the north of Thailand. 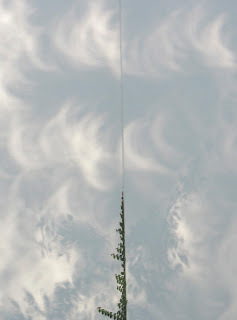 I happened to be at the gallery/studio of an artist friend and we discovered an accidental, kinetic work of art on his front wall: a large tree between us and the sun acted as multiple pinhole cameras and projected the eclipse on the wall in numerous images which changed in a slow motion dance of shadow and light. It was quite surprising and beautiful. Here is one image.